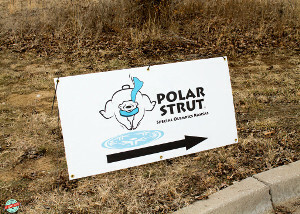 The annual Polar Plunge and 5k Strut to benefit Special Olympics Kansas is always a memorable experience, particularly for those taking the leap into the lake for such a great cause. The Kansas City roller derby leagues are there every year to help raise money for our Special Olympians, and this year was no exception. 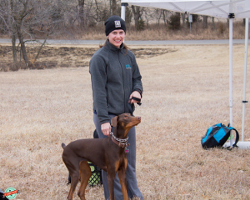 It was KC Derby Digest‘s third year joining the derby festivities out at Shawnee Mission Park, and as always, there was nary a dull moment. I’m told that the water in the lake this year was the coldest it’s ever been, even colder than in 2011, when Plungers required the assistance of men with chainsaws to even get into the water. Longtime sponsor Papa Murphy’s was on hand to mercifully feed us pizza as the morning turned into afternoon, and the highlight of the morning had to be when Fox 4 meteorologist Michelle Bogowith‘s doberman freaked out about the drone filming the festivities from overhead. Animal comedy never disappoints. SCARY SKY THING IS SCARY. We threw together a fun video overnight of KC Roller Derby’s day at Shawnee Mission Park and uploaded it to YouTube for your enjoyment. Feel free to share as you like, it’s only about a minute and a half long. It includes several snapshots from the event, as well as the plunge into the lake at 11 a.m. Many thanks to Donna Zimmerman, Senior Vice President of Public Relations and Communications, for providing KC Derby Digest with press accommodations at this year’s very successful Polar Plunge and 5k Strut, and thanks as always to the incredible men and women of Kansas City roller derby for taking the time to help such a fantastic organization. We will definitely see everyone out there again next year! Thanks for coming out and supporting Special Olympics and the KC roller derby leagues. We appreciate it!